You state you wish to travel to UK for 6 months to visit a friend. You have not produced an invitation from your friend or supporting documents in relation to their residency, employment, financial status or ability to accommodate you in the UK. I note that you were refused leave to enter the UK on 7 Sept 2016. The reason for the refusal were that initially interviewed you advised the IO that you were studying in Malaysia and taking the Bar exam in April 2017. This was untrue as you failed to mentioned that you failed your exams in the UK and were unemployed in Malaysia. In addition, you initially stated in interview that you were seeking medical treatment in the UK and a search of your bag revealed a quantity of 'doctored' medical documents. Give the above I have cause to doubt the integrity of the information contained on your application and I question your reasons for travel at this time. I am not satisfied that you are genuinely seeking a visit visa for a limited period not exceeding 6 months or that you intend to leave at the time required. I'm a Malaysian and I've a visa free passport. I've been travelling twice to the UK with a student visa when I was doing my degree and post graduate diploma. The third time was for leisure to visit my partner for 2 months from March 2016 to June 2016. I didnt apply for any visa for the third visit as my passport is a visa-free passport and I didnt have any problem entering at that time. All these visits I didnt overstay and left UK according to time mentioned in the landing card. I do not have any immigration problem or any criminal record anywhere in the country. So, I had planned another visit again on 6 September 2016 and wanted to stay there for 6 months. The reason for this visit was that we had a really bad break up but we are back together again and I thought of staying there longer to sort our problems out. I bought a return 6 months ticket. When I reached the airport, they questioned me about being there for 6 months and that I do not have sufficient funds. I know I do not need much money as I'll be staying with my partner's family house. I didn't print out my bank statement as I dont think they would need it as I didnt require it for past 3 visits. Apparently, my mates said that visits to the UK for more than 3 months would raise red flags. At the airport, the IO called my partner and interviewed her and we had not problems with that. But the issues occurred because of the edited and omitted medical documents that I brought along with me. Honestly, they were for my mate to get her off work but I stupidly brought it with me as everything was in my medical file. The purpose of me bringing the medical file was to perform a biopsy for my Thyroid but i clearly indicated that only if i can afford it as I've already an appointment set in April 2017 to do the biopsy in Malaysia. Therefore, the IO told me that I brought the 'edited and omitted' document was for the intention of gaining recourse to public funds even though I showed my appointment card for my biopsy set on April 2017 in Malaysia to him. The IO told me that I was not ban to enter but suggested that I apply for visa in Malaysia and to counter all the red flags that was mentioned in the Notice of Refusal of Leave to Enter. Thus, I applied and still got refused. I attached bank statement of having 3700GBP, letter of the refusal, attached quotation of medical insurance and flight ticket upon if my visa get approved. I indicated in my application that I am unemployed and staying with my mother and that she is funding me. Reason why am not actively searching for a jobs is because I am waiting for an appeal to proceed with my Bar exam and the appeal result will come out on 5/10/2016. I attached again my biopsy appointment which is due in April 2017 to make sure that I am not trying to gain recourse to public funds.I told them that the 'edited and omitted' documents are not in my possession anymore and that it was for my mate. What upsets me the most was that on my application rejection was on a new set of reasons. They didnt asked me to attached an invitation from my partner or supporting documents in relation to her residency, employment, financial status or ability to accommodate me in the UK.If they did, I would have definitely attach it together. I do not see the relevance of them mentioning about my Bar exam. Yes i did failed my exam and I told them that I was waiting for my appeal and that if it goes well that I will proceed with my exam in April 2017. I told them I was employed for 3 months and that I was unemployed after that simply because I had to concentrate with my exam which had took place in March 2016. They failed to get the whole picture but just took the negative bit of my information that I gave. Do I have to prove both that my personal circumstances had change significantly and that I have new compelling evidence for my future application or just prove one point would be enough? If my appeal for my Bar exam gets approved, and in my application I mention that I'm visiting the UK to meet my fellow classmates and lecturers to get materials for my exam and also sit for the exam in March 2017 (it's actually March not April 2017 as I've checked the timetable) would that consider a change in circumstances?Bear in mind that my exam dates are 24 March 2017, 2 May 2017 and 4 May 2017. I have the option of doing it in the UK or also in Malaysia. I was thinking of doing 24 March 2017 paper in UK and the remaining in Malaysia because if I go to the UK this end of October means I cannot do the exam papers that is set in May as its more than 6 months visit. And that probably, give them reason that I wont overstay as I've to take my exams in Malaysia. Or do you think this reason would back fired? If my appeal for me to proceed with my Bar exam doesn't gets approve, how can I visit UK again? Which means that my personal circumstances has not change but I can give them evidence in regards an invitation from my partner or supporting documents in relation to her residency, employment, financial status or ability to accommodate me in the UK. What do they mean with invitation? Will a letter from my partner sufficient enough? In my visa application I indicated that purpose for my visit was to celebrate her belated birthday, celebrate halloween, xmas, new year and our anniversary thus why the 6 months. My partner just started her work and is working with a working agency. Her mom is still supporting her. Should I also attach her mum's employment and financial status? How can I be sure after fulfilling both notice of refusal(the one I received at the airport and the other of my visa application) points that they will accept my application and that they wont give me new set of reasons of refusal? How can I get out from the shadow of the edited and omitted documents that I brought? If they are so skeptical of me staying there for 6 months, can I just apply for just 3 months saying that I want to celebrate all this festive seasons with my partner and also get materials from my uni and come back in January 2017?I think that would make sense, as they know that I need to still come back to Malaysia and sit for my exam. My concern is that I just wanna see my partner (she's a British citizen) and go back that's it. You are a Malasian national and accordingly do not require entry clearance to visit the UK. Earlier this year you were removed from Terminal 5 LHR under Paragraph 320. You then applied for entry clearance and were refused under Appendix V 4.2 (a) & (c). 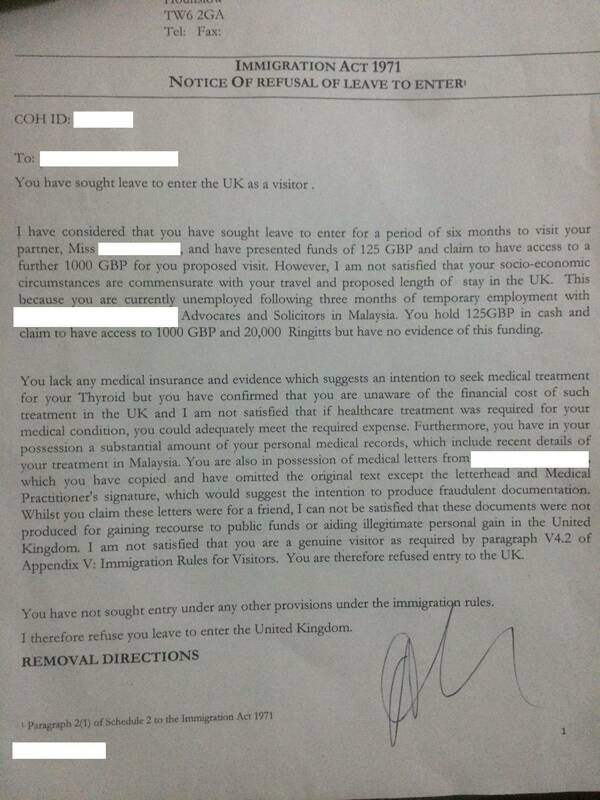 It's all bad, but most damningly, the Immigration Officer made a good case that you intended to defraud the NHS. This is the type of thing that gets them very upset, it echos the British public mood of frustration at people abusing the NHS and you can expect the authorities to stay upset about this for a long time. If my appeal for my Bar exam gets approved, and in my application I mention that I'm visiting the UK to meet my fellow classmates and lecturers to get materials for my exam and also sit for the exam in March 2017 (it's actually March not April 2017 as I've checked the timetable) would that consider a change in circumstances? No. This highlights a big misconception that people with a history of refusals often have. You want to change the premise of your application. That's fine, but changing the premise is not a change of personal circumstances. They are two different things. Every time somebody applies at an airport or using visa4UK, they give a premise. A new premise does not change the underlying facts about YOU, i.e., your lifestyle, your social ties, your economic situation, and so on. If your circumstances are all the same, then you will not qualify and can expect a refusal. This is a bad idea; it's grasping at straws. If you are in reduced circumstances, and your partner is in reduced circumstances, and your partner's mum is in reduced circumstances by having to support two adults, then no, this scenario does not depict a genuine visitor. The remedy for this is to change your personal circumstances such that you are an established professional on a stable career track in Malaysia with a great history of solvency and financial independence. This is what they want to see and the best recipe for success with UKVI. In particular, they love to see lots of travel history to the USA or Canada or Australia; they eat it up and it's a wonderful calling card in a visa application. The normal advice for this is to instruct a UK solicitor with a practice area in removals to represent your next application. They can think up polished and eloquent explanations (that are truthful and not lies) that Entry Clearance Officers can appreciate. It's how they make their living and what they are paid to do. Given that your reserves are about GBP 3,500, this isn't an option for you. So the advice above about developing an independent lifestyle applies. I think that would make sense, as they know that I need to still come back to Malaysia and sit for my exam. My concern is that I just wanna see my partner (she's a British citizen) and go back that's it. You have missed the point. Overstaying is the smaller worry they have. The damning issue is that they have it in mind that you intend to break our laws whilst in the UK by defrauding the NHS. And they made a good case for it also. Trying to wiggle off the hook by saying it's for someone else does not exclude you from participating in a joint enterprise. Incredible to relate, you do not have a ban so Paragraph 23A of the rules kick in. It means Malaysian nationals do not require prior entry clearance and you are free to book an air ticket and try your luck in Heathrow all over again. Alternatively you can apply again from Malaysia for entry clearance and avoid the distress of wasted airfares and removal from port. The outlook is not favourable for either of those alternatives owing to the things pointed out above, but it's your call. All of the various paragraphs and appendices cited in this answer are at the Home Office's site: Immigration Rules - Guidance. The removal notice you got in LHR has your case number on the top, hang on to it. Not the answer you're looking for? Browse other questions tagged visas uk visa-refusals removal or ask your own question. Need to travel to UK to retake an exam but my visa application was refused; what are my options?